Finding the courage to ask someone out on a date is not easy… let alone trying to find the right words in French. Here is my lesson on asking someone out in French. 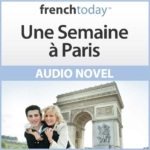 1 – How To Say “Would You Like To Go Out With me” in French? Tu veux sortir avec nous – go out with “us”, so group of friends going out socially. Now, there are some very important differences between dating in France and dating in the US for example. I wrote a whole article named French Women don’t date – make sure you read it should you intend to date in France. 2 – How to Say Boyfriend / Girlfriend in French? Actually, here we run in our first problem. Even saying girlfriend/boyfriend is problematic in French! The typical word for a boyfriend in French is “un petit-ami/ un petit-copain”. Un ami, une amie (strong N liaison/gliding “Nami”) – a friend, or a boyfriend/girlfriend. For homosexual relationships, we tend to use “mon/ma partenaire”. The French sometime use the word “un compagnon / une compagne” for long-term adult relationships. If you are engaged, it’s “mon fiancé, ma fiancée”. 3 – What Does “Être Célibataire” Means in French? It means to not be in a relationship. It doesn’t mean to be celibate. It’s also the marital status of someone who is not married. Tu veux être ma petite-copine / mon petit-copain ? would you like to be by girlfriend/boyfriend? But only young teens would use that line… Adults would use more standard pick-up lines. Ah… the pick-ups lines… Of course we have some traditional ones, like the actor Jean Gabin saying “T’as d’beaux yeux, tu sais” (Tu as de beaux yeux, tu sais = you know you have gorgeous eyes) in the movie “Quai des Brumes”. This line became a classic, and French people use this pick-up line in a humoristic kind of way – but still paying you a compliment of course. I have no idea where this one comes from. It means “hi pretty blond” but can be used with a brunette… it doesn’t matter. It’s humorous as well, it is to be said with an exaggerated seducing look, kind of “hey gooooorgeous” or “how you’ doing?”… and is a smooth way to make fun of yourself and actually pay a compliment to “la belle”. J’aimerais être une de tes larmes pour naître dans tes yeux, vivre sur tes joues et mourir sur tes lèvres – I’d like to be one of your tears to be born in your eyes, live on your cheeks and die on your lips. Tes yeux sont comme des étoiles – your eyes are like stars…. pleeeease! Excuse-moi, tu as l’heure ? Excuse me, do you have the time? Tu es avec quelqu’un ? Are you with someone ? Tu veux (aller) boire un verre ? Would you like (to go for) a drink? Je peux t’offrir un verre ? May I buy you a drink ? Tu viens souvent ici ? Do you come here often ? Tu veux aller faire un tour ? Do you want to get out of here ? Tu es libre pour le dîner samedi ? Are you free for dinner on Saturday? Tu me donnes ton numéro ? Could you give me your phone number ? Here are a slap-stick videos about flirting. “Samantha”, a popular TV sketch featuring a guy dressed as a woman (French people find that very funny for some reason).